Everest Base Camp trek is one of those treks that deserves a place in everyone’s bucket list. 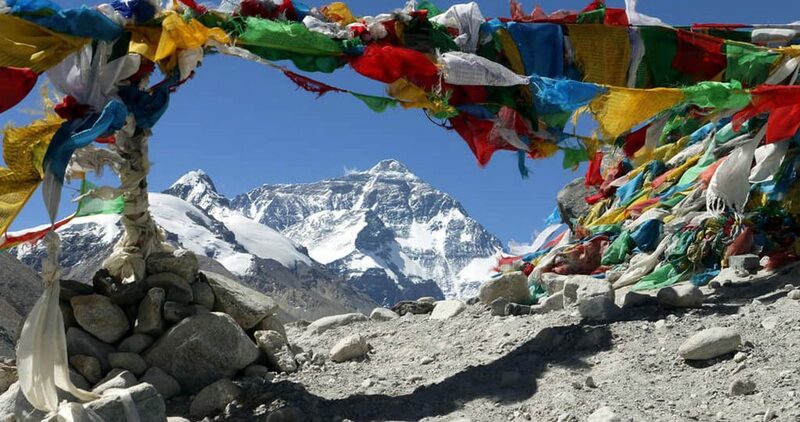 The only way we can describe Everest Base Camp Trek is as a magical and enchanting experience. One of those adventures that is sure to leave you in awe and asking for more. As soon as you land in Nepal the diverse landscapes and unique local cultures will greet you. You can see a magnificent view of snow-capped mountains even from the capital on days with clear skies. The adventures in Nepal will be one of the best experiences of your life. The Everest Base Camp trek the biggest cherry on top when you travel to Nepal. The Kathmandu valley is an amazing place in itself and a place packed with adventure. But, your real adventure begins after you get on the plane from Kathmandu to Lukla. As soon as your plane takes off you will be able to observe scenic views of the hills. The terrace farmed hills capture the heart of anyone and everyone. And the best part is yet to come. You will land at the Lukla Airport which people describe as one of the most beautiful airports in the world. There is a single runway on top of a tall hill which then goes pretty deep down to form a valley below. The landing is surely going to be one full of adventure and excitement. From the Airport you will start your trek towards Phakding. The divine views of the mountains pull you close towards them with every heavenly step. And the air starts getting fresher and crisper. When you reach Phakding you will see the Kusum Kangraru Mountain in all its glory. You will rest at Phakding for the night. The next day after you have rested well and had your breakfast you continue the trek. 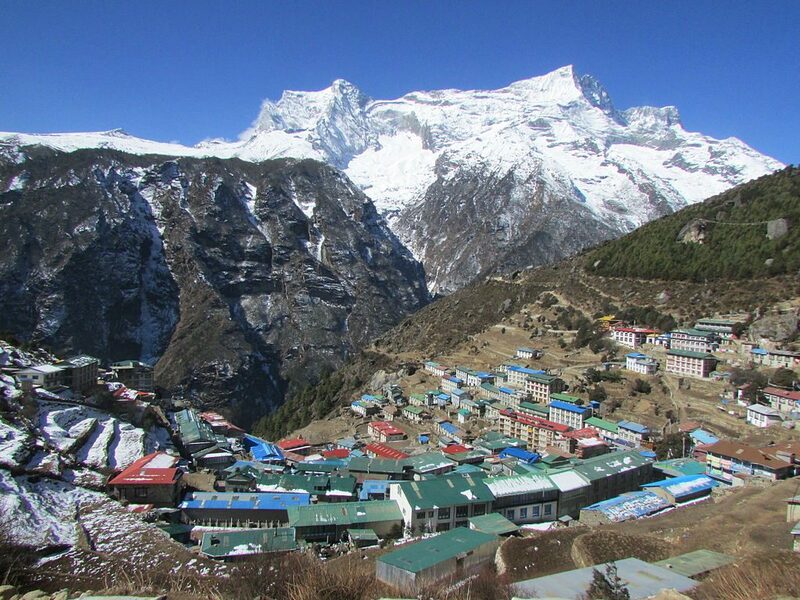 You will be trekking to Namche Bazaar. On the route to Namche Bazaar, you will get a chance to trek through the Sagarmatha National Park. The park falls on the route and is a beautiful trail. Diverse landscapes and amazing lush forests greet you in every step of the way. In addition to those, small charming streams and waterfalls all along the trail will surely make for a dreamy walk. 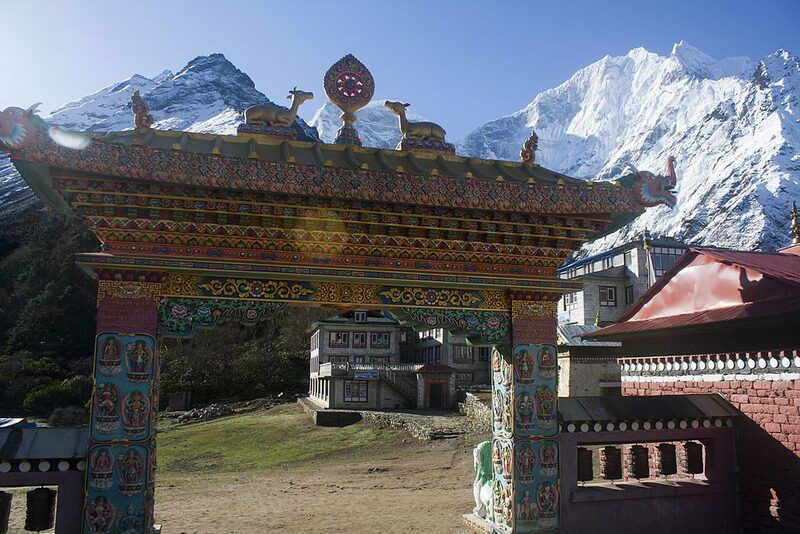 Namche Bazaar is quite a place to visit and one of the busiest place on the trekking route. 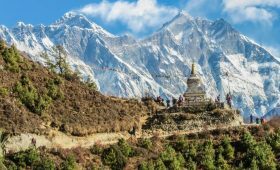 The hustle bustle of tourists from all around the world, all trekking towards the same enchanting Everest Base Camp is something you are sure to love. 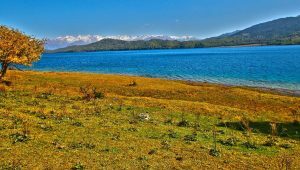 The stories of trekking and traveling and the local folk tales are something that you definitely shouldn’t miss. Make sure you make time and visit a local place to immerse in the folktales and all the wisdom that the locals embark upon you. After a long day, you will rest for the night at the marketplace, Namche Bazaar. You can enjoy some of the modern facilities like atm, cakes and a more defined menu here. The following day you will start to trek after breakfast. The trek from Namche Bazaar to Tengboche is a rather easy yet rewarding one. The trail is one of the most blissful ones. The view of lush rhododendron forests will take your breath away. And along with that, the crisp mountain air will fill your lungs with an incredible feel. As you get closer to Tengboche the view of Everest will glaze your eyes. The divine view of Everest seen from this point is something that no words can describe. 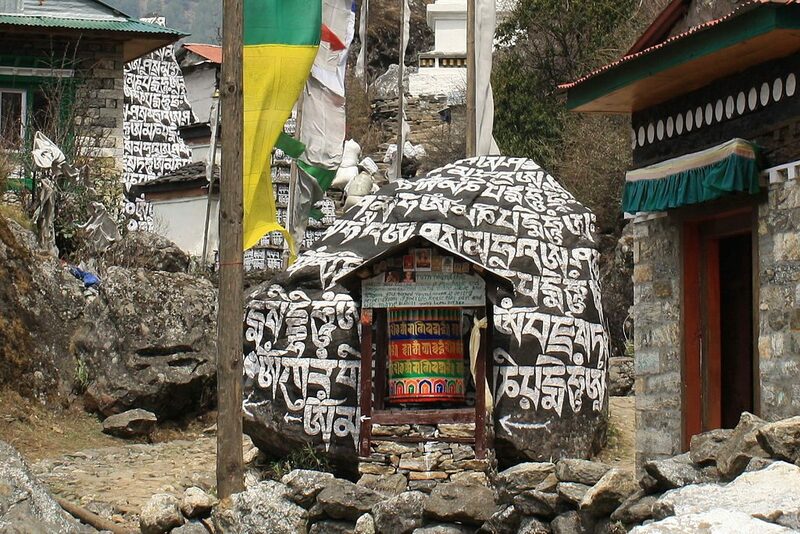 You will also get to see one of the largest monasteries in the Khumbu region which is The Tengboche monastery. A spiritual hub, this monastery is one of the most peaceful places and perfect to just relax and rejuvenate after the 5-hour trek. The next day you have a short 4-hour trek from Tengboche to Dingboche. The trek offers picturesque views of many mountains. Some of them being Mt.Lhotse, Mt. Ama Dablam, and the Island Peak. But you are in for an adventurous treat as you have to cross a suspension bridge to get to Dingboche. The bridge joins two hills and the view down is scary yet incredibly beautiful. Finally, at Dingboche, you will rest for the night. An invigorating trail awaits you the next day. A 5-hour trek from Dingboche will take you to Lobuche. Along the trail, you will see a Trekkers Aid post- which helps to treat the trekkers. The amazing view continues and snow-capped mountains shine through. You will be able to see many mountains from this point. 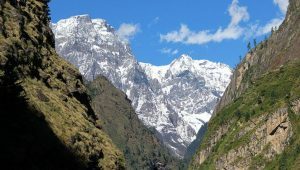 The mountains such as Mt.Khumbutse, Mahalangur Himal, Mt.Lingtren and the beautiful Mt.Pumori are just some that you will see from this destination. After a 5 hour walk to Lobuche, you can take the time to relax and enjoy your evening. You will spend the night here. The wait is almost finally over as on day 6 you will be reaching Everest Base Camp after a trek of 7 hours. The trek starts slowly through uphill climbs which will be a little tiring yet fascinating. 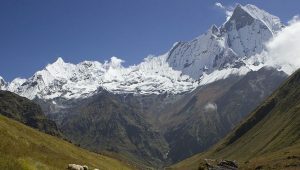 After trekking for about 2 to 3 hours following the world’s highest glacier- The Khumbu Glacier you will reach Gorak Shep. The trek for the day doesn’t end here though. You will be trekking for another 4 to 5 hours to reach your destination; Everest Base Camp. The trek is quite exhausting. But you will reach one of the most beautiful serene places in the world. So, it will surely be worth it. You will definitely not want to blink your eyes, this place is the most breathtaking one you may have ever seen. And after all, you are standing at the base of the tallest mountain in the world. You will head back to Gorak Shep for the night. The next day your journey back starts. 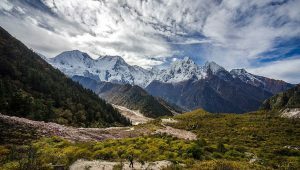 You will be trekking to Kala Pathar and back to Pheriche. But don’t worry as the way down is just as breathtaking as the one up. The emerald view of mountains will surely leave you in awe. 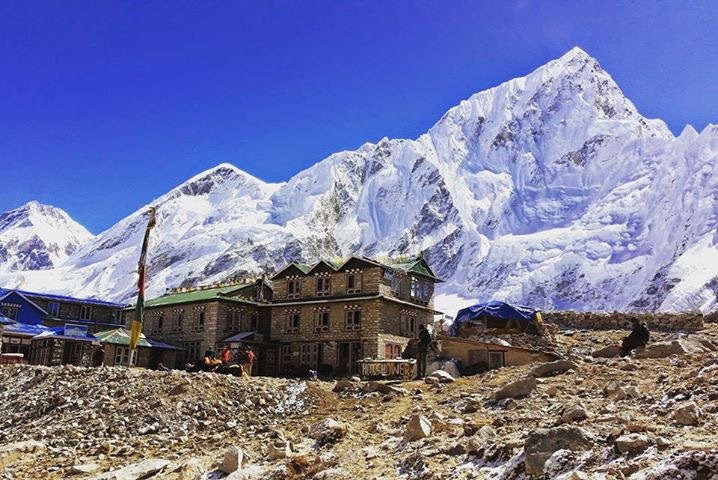 Kala Patthar is a very popular destination for trekkers. 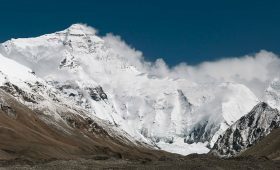 The point provides panoramic views of Mt Everest, Mt Nuptse, Mt Chagatse, Mt Lhotse, and the Pumori among many other peaks. The trek is a 7-hour trek and a tiring one too. The trek is mostly a downhill trek and so the path may be a bit steep. So, make sure you rest well the night before. Today you will rest for the night at Periche. The trek back to the commercial hub that is Namche Bazaar is a blissful one. You will be able to see views of beautiful landscapes as well as the diversity of culture en route. If you had missed a tour of the town before, this is your final chance. But it is your preference. You can stay inside your hotel room and relax or explore the beautiful town. Everything feels amazing in this alluring mountain town. You are sure to not get enough no matter how long you explore this place. As this is the way back, be sure to enjoy everything that you missed at Namche. You will be resting here for the night. 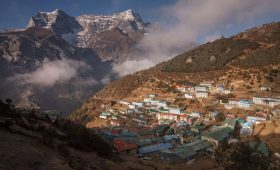 The final trek is a 7 to 8-hour trek from Namche Bazaar to Lukla. En route you will get to experience suspension bridges and steep trails. The Dudh Koshi river is sure to make your heart sway as it flows with all its might. The air smells crisp and the river makes the atmosphere even more lively. This is where your trek ends. You will have been to the base of Mount Everest and back. A moment of pride and happiness. You will stay at Lukla for the last night of the trek. The last day you will be flying back to the fascinating city of Kathmandu. After a 45 minutes flight, you will reach the capital. An airport representative will pick you up. Then, they will guide you to your hotel. On the flight back you should take in the view one last time. This is the moment the divine mountains bid you goodbye and your trek officially ends. The Everest Base Camp Trek is an amazing experience. Not only does it allow you to see awe-inspiring views of magnificent mountains but you will get to experience much more. The diverse ethnicities and customs of the locals will make the trek even more interesting. Besides that, you will get to meet trekkers and travelers from all around the world. You will get to hear stories and folktales from all around the world. And it will be a memory that you will cherish forever. Do you have any question about the trek or want to book it? Be sure to contact us.